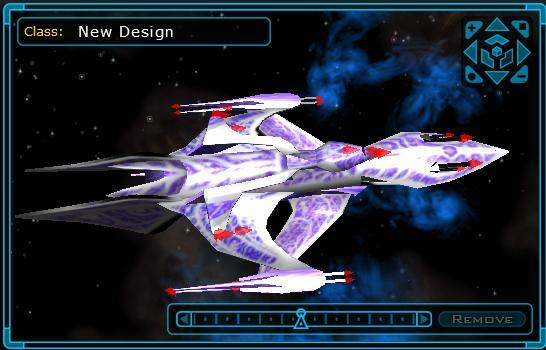 This is the White Star a medium sized fast Combat Vessel from Babylon 5 combining technology from both the Minbari and the Vorlons. My game is not showing the White Star at all, I did as the instructions said but it will not show up in the game. yeah, thats a known problem, but I dont know what it is related to. the model itsself doesnt contain any lighting information so it leaves all lighting-related stuff to the game (it doesnt even allow self-illuminating materials). Thanks for the resize and extra hardpoints. And yes, I figured out how to add it instead of replacing an existing hull. It is now a meduim hull in my games. One thing though, and sorry if I am nitpicking. You don't have to change anything because it looks great as is. But, the lighting is from below, and the top of the model looks like it is in the shade. the thing is when I work on a ship and get it into GC2 I use the S0_tiny_1.X to test it out (I just create a new game so I dont have access to larger hulls anyway). also takes less time to load and tab out and back in when I change something. therefor I cant really estimate how the models look when they are used for a medium hull or larger hull. The game takes the base size from the X-File and scales them up and down on its own. For instance if I use a large model it may look just fine using it as a tiny ship hull, but may as well look way too big on a large or huge ship hull. I just found how to add it as a hull. So I did it as a small hull for now. Too cool!. But, I really think the WhiteStar should be classed as a medium hull, so I await eagerly the upsize. And if you could add some more attachment points it would be even better. Do you know if there is a way to give the models their own unique name series? S100_Structure215.X works, as does 216 and 217, but the others I put in after that did not show up. You mentioned in the readme about modding the GC2Types file. Could you give me better instructions? It would be ccol to use all the Bab5 series ships in a game. ya, it should be even easier when the mod-folder is working (patch 1.2 hopefully). I will work on the size of the White Star and probably upload a larger version during the week (seems Stardock approves most things on the weekend anyway). It works much better as jewelry, and I don't have to overwrite a file doing it that way. I just added it as S100_Structure215.X . And it can be sized roughly twice as large doing it as a jewelry piece, also. Though, even so, it still seems a tad small. I rthink the original model should be twice the size, which would still put it in the small category. you can scale the weapons and engines and stuff with the slider below the 3D View in the ship designer. at minimum size the engines for instance fit just fine to the size of the model. I made the model smaller on purpose because the White Star though extremely powerful is a fast and small ship (size of a corvette, firepower of a destroyer). I may increase the size in a later update though if others agree that it needs to be bigger. I just tried to use it, but the scaling is way too small. I tried it both as a tiny and as a large ship with the same results. A warp engine covers half the ship, and it shows up really small in the window. Have I done something wrong, or do I need to modify an XML file in some way? I love that ship, thanks for putting it up. Now, how can I scale down the engines and weapons so they do not totally wreck the lines of that wonderfull dhip?